All I need is a miracle, All I need is You! Like other jobs, this role has it’s own positives and advantages as well. For one, mostly it’s not a stressful job (which means your hair won’t gray as soon as others) and you will have suitable fixed timings . Also, you will be far away from office banter, office gossip and negative vibes. And then if you’re lucky with not too many walk-ins, you can click some selfies with no one watching (but first make sure you don’t have office cameras). 1. 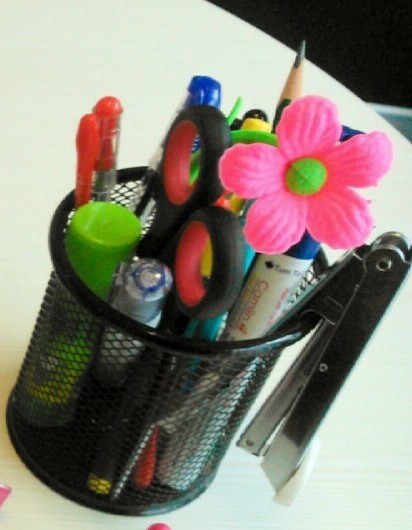 Basic stationary: This is the most basic thing your desk should have besides your desktop, keyboard and mouse. Stationary will include pens, pencils, erasers, white ink, stapler, punch, pins, scissors, post it etc. Keep in mind, since it’s not your house, you will require a simple and professional looking pen stand to keep these things in order. I can assure you that even though every employee is given stationary, they will keep coming to your desk to grab a pen/ pencil before rushing to that meeting they are getting late for. It’s obvious that you need to have pens that work! 2. 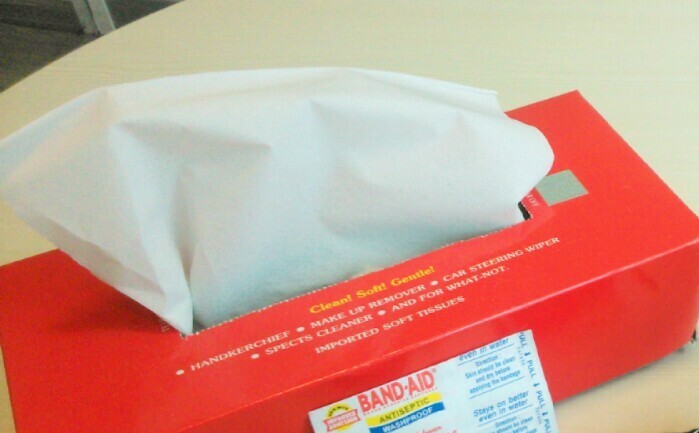 Tissue Box: Again, this is a staple. 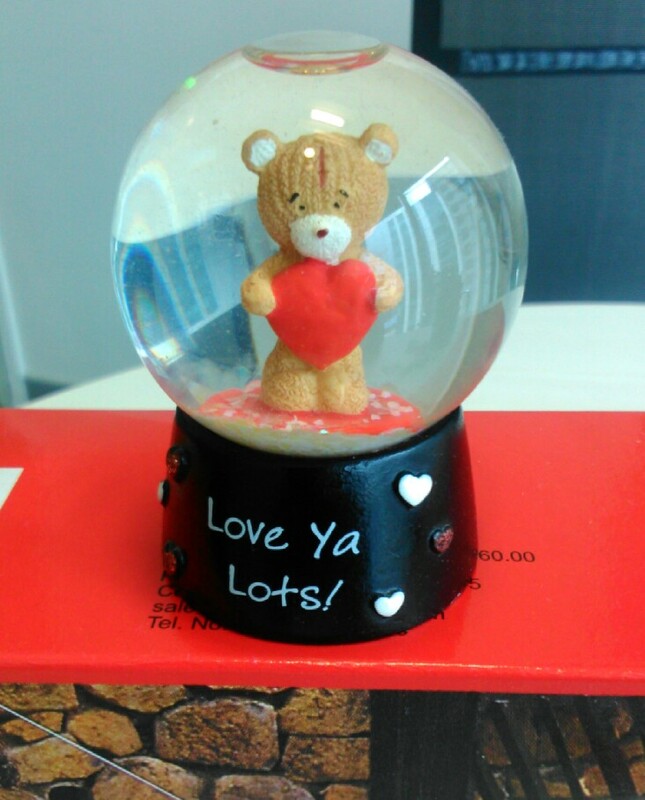 You never know when your cup of tea spills all around your desk and keyboard making you a nervous wreck. Also, you will have colleagues who even though they vist the fresh room before leaving office for a meeting, they will grab some tissues from your desk on their way out. 3. 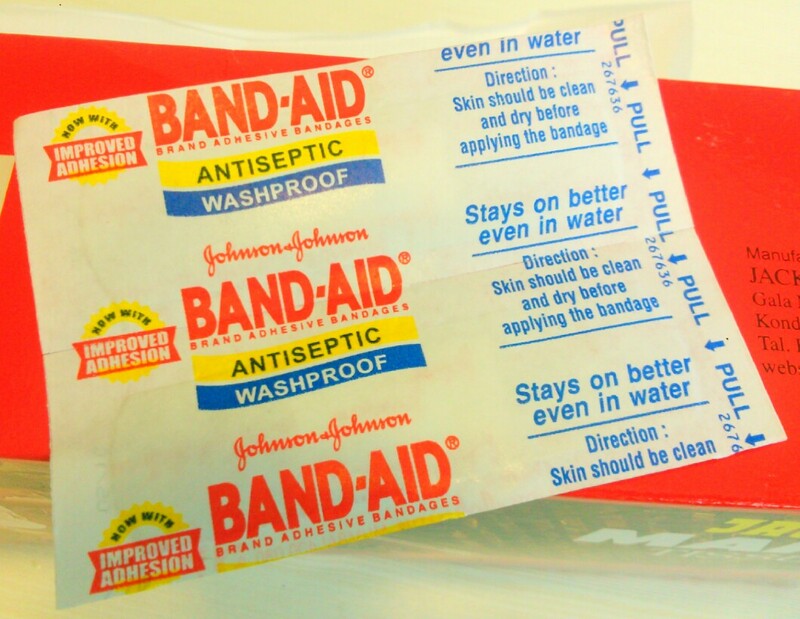 Band-aid: It’s not possible to keep an entire first-aid box with you at your desk, but whenever someone approaches you with that sad boo-boo look, pull out your band-aid and hand it over. Look at that face turn into a smile as though you’ve just saved their life. If you’re not as petrified as me, you can offer to help if possible. Also, with women and new shoes, blisters are nothing new. Band-aid always to the rescue. 4. 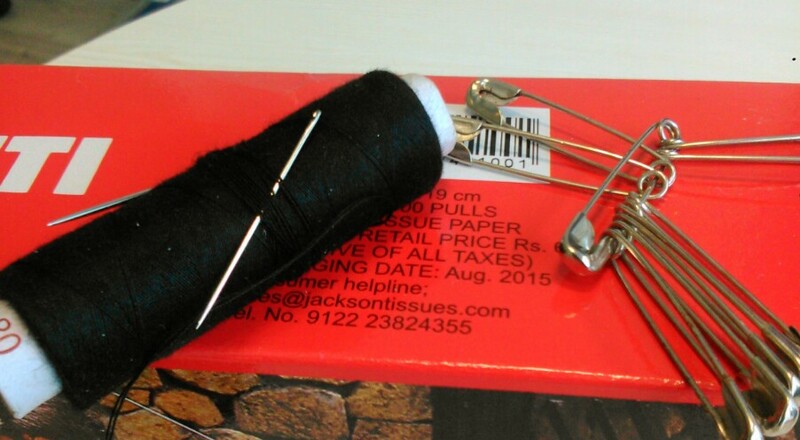 Needle and thread / Safety Pins: I swear I’ve seen instances where employees are strutting out for a meeting and suddenly the slit on their skirt goes farrrrr (roll the rrrr to get the sound I’m making). It can be the most embarassing situation for the employee and she may just not know how to fix the issue. Here’s where you pull these out and save their day. I assure you, you will be thanked profusely, and maybe you may even get a treat. 5. 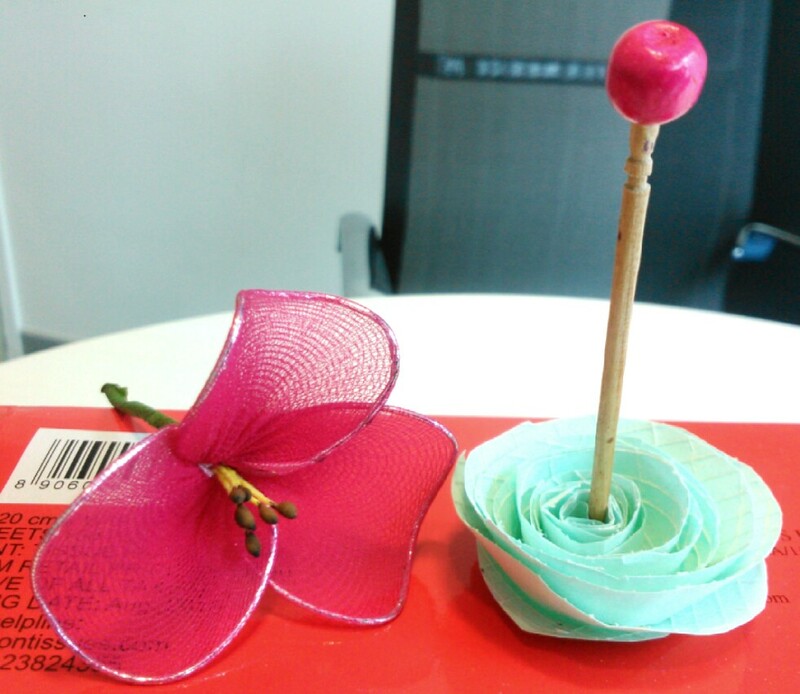 Some personal touch to your desk: A colleague made these little flowers for me. The pink one is out of stocking and the green one is out of a wasted courier envelope.Adding these personal little things help me remember there are days when you are appreciated for who you are and what you do. Also, while you may have colleagues waiting for someone at the reception or while waiting for that band-aid, these will initiate conversation. One of my colleagues, even keeps all post-it notes, even though none of those are reminders. It’s also a great idea to have a folder containing all near-by restaurant menus, have some sanitary pads, and some loose change for someone when they desperately need it. I also suggest, since these are the very few occasions that people may come up to you, be approachable and warm. Make conversation with them so the next time they see you around, they will acknowledge your presence. It’s equally important to dress right and have your hair and make-up in place, as professionally talking “You are the face of the organization”. I’ve summed up all that I could think of. If you would like to add any points or give me your comments, I’d love to hear back from you.